A Japanese-led team of scientists has captured on film the world’s first live images of a giant squid, journeying to the depths of the ocean in search of the mysterious creature thought to have inspired the myth of the “kraken”, a tentacled monster. The images of the silvery, three-metre (10 feet) long cephalopod, looming out of the darkness nearly 1 km below the surface, were taken last July near the Ogasawara islands, 1,000 km (620 miles) south of Tokyo. Though the beast was small by giant squid standards - the largest ever caught stretched 18 metres long, tentacles and all - filming it secretly in its natural habitat was a key step towards understanding the animal, researchers said. “Many people have tried to capture an image of a giant squid alive in its natural habitat, whether researchers or film crews. But they all failed,” said Tsunemi Kubodera, a zoologist at Japan’s National Museum of Nature and Science, who led the team. “These are the first ever images of a real live giant squid,” Kubodera said of the footage, shot by Japanese national broadcaster NHK and the Discovery Channel. The key to their success, said Kubodera, was a small submersible rigged with lights invisible to both human and cephalopod eyes. He, a cameraman and the submersible’s pilot drifted silently down to 630 metres and released a one-metre-long squid as bait. In all, they descended around 100 times. 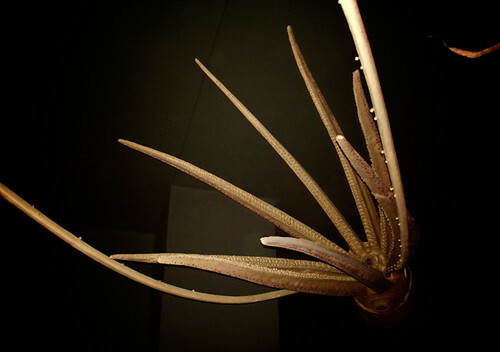 As the squid neared they began to film, following it into the depths to around 900 metres. Until recently, little was known about the creature believed to be the real face of the mythical kraken, a sea-monster blamed by sailors for sinking ships off Norway in the 18th century. The full film, taken last July for the Japanese national broadcaster NHK and the Discovery Channel, will be publicly aired later this month.